It’s no secret that I am a big fan of this series. I love the world-building. I love the originality. I LOVE the hero. And this was a good book. It wasn’t my favorite in the series, though, and I’ll get to why in just a minute. The story begins as Sacrificial Magic did: with Chess and Terrible happy and in love. As someone who has seen what they’ve gone through to get to this point, it’s so satisfying. Chess knows the treasure that she has in him; she acknowledges that he’s her everything. And while she struggles with her lack of self-worth, it seems she has learned some lessons about trying to trust in his love for her. There are two main problems she has to deal with here. One is fact that Lex is the new head of his family’s drug turf, putting him more at odds with Terrible than ever before. The other, is that some really dark magic has started infecting the people of Downside, turning them into zombie-like entities, nearly impossible to kill. Of course, with her magic abilities, Chess is really the only one who can stop them. The first half of the book is pretty low key. It moves along quickly and comfortably. Then Chess shows her true colors again, leaving me feeling punched in the gut. I won’t get into the specifics, but at this point, I feel like the books have developed a pattern: 1) There is a problem only Chess can solve. 2) Terrible is her rock and she doesn’t know what he sees in her. 3) She screws up royally in her personal life. 4) She saves the day. Don’t get me wrong, there are really, really good things in this book and no way would I tell a Downside fan to skip it. What I am saying though, is that I need to see more growth from Chessie soon. Every time she betrays Terrible, she hurts me. She creates this horrible knot in my stomach that makes me want to shut the book. I don’t WANT to want to shut the book, Stacia Kane. I want to glory in lines like “Love you right, Chessiebomb.” That doesn’t mean I can’t handle some angst. The side arc with Elder Griffin was heartbreaking, but still masterfully done. I just don’t want to see Chess sabotage herself the same way yet again. Terrible continues to be one of my favorite book-heroes of all time –taking his awesomeness to even greater heights with his latest promises and assertions of love. Even in his darkest and most intense moments (and boy does he have one here,) it’s like he has this gravity that pulls me deeper and deeper into his orbit. But as we learn more about the repercussions of Chessie’s actions, I’m scared for where the future will take him. I suppose that all my really strong feelings are a true testament to how insanely talented Stacia Kane really is. I am anxious and excited and nervous and jumble of all kinds of other emotions as I think about what may be coming next. Chess, please don’t let me down. Chess does need to start improving. Especially with her relationship with Terrible. I am with you, I can handle some angst but there are just some things that I can’t handle. If not for you, I might have just stopped this book in the middle of that scene. I’m glad you kept reading. It says a lot about Stacia Kane that she can inspire such strong reaction, but Chess is killing me! 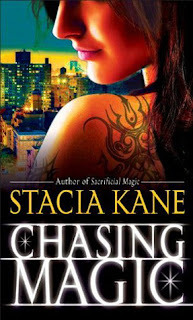 Yeah, I tell Stacia Kane all the time that she’s evil 😉 She has a way of making me want to throw the book across the room when Chess does something stupid and the next minute be swooning over MY Terrible. I absolutely love this series! Me too. She really riles me up. But then Terrible makes me swoon. Totally agree. Chess needs some personal growth. I’m not saying she needs to be Betty Crocker but she needs to give Terrible a break. Yes! My poor Terrible. He deserves to be happy! What a great compliment, Heather. Thank you. I have high hopes for the next book too. I’m not ready to give up yet. I love Terrible too much.